Central California Soaring Association: Saturday April 5th. A "Painter's Sky". Comment: Beautiful cumulus-filled skies. Not too many pilots showed up. Early in the morning a pourover wave was marked in the Chorro Valley near San Luis Obispo, this confirmed the north winds that I was expecting. The drive over from the coast was under a layer of fog for the most part. Atascadero to the Avenal Hills was foggy, yet broken and not terribly thick. With clear skies on the east side of the mountains and nice cu around 3500 even before 10:00. Cool and windy when I arrived at around 10:00. Alex and Craig were out filling squirrel holes on the runways. Carl Engel showed up shortly after me, then Harold and Jose, a young man doing community service that Harold was mentoring. Jose took over squirrel duty and no doubt made the runway safer. Jose Rivera doing volunteer work for our club. Thanks Jose for the effort. With Alex and Craig's help we rigged 5H for the days journey. I had called for a volunteer the night before, Craig was the first to agree to the terms. I could promise an adventure, but not where we would end up at the end of the flight or how quickly I could get back to Avenal. The plan was to fly from Avenal to Santa Ynez and then try to get up in wave that I expected would form due to the north winds. Climb in wave and explore a little, then return to Avenal. Simple. Carl was out for a last bit of solo training in preparation for his checkride. Carl Engel with another training flight before his checkride on April 12th. Carl turning base after a one-hour flight in a beautiful sky. Larry Johnson was on the schedule to come out for a BFR, hopefully soon to be back in his Russia. Larry Johnson and Alex Caldwell doing a BFR flight. Carl Engel helping. Larry and Alex landing after more than an hour aloft. Tar Canyon background. Joe Anastasio also came out and then due to the light student schedule, Jan was planning on towing and then flying 7K. Joe Anastasio assembling his PW-5 in prep for a nice long flight. Joe is launching into a "painter's sky". Carl prepped Orange Crush and went up for a flight. He found lift, but also fairly strong sink and stiff winds that had him back at the airport sooner than expected in order to not drift downwind too far. Not bad for an 11:30 launch though. He followed that up after we left with another 1.3 hour flight for a total of about 2 hours for the day. Carl Engel landing after another hour-plus flight, his second of the day. Joe Anastasio had a great flight up past Coalinga and down to around hwy 41. I think I only briefly saw Joe at his trailer as we launched. I wasn't really aware he had flown until seeing his OLC post. I was happy to see that, I love showing the activity and variety of soaring we get to enjoy. Jan Zanutto landing on runway 7 after a fun flight in the mountains. Jan got some time in 7K and also flew up abeam Coalinga. I don't think he posted his flight to OLC yet, but I saw a picture from up in the mountains and it looked like he did well in the windy conditions as well after spending some time on tow duty. Great to see people sharing the load on towing and getting some soaring in as well. Aside from flying, Carl and Harold blew out the pitot systems on the 2-33s and 1-26. Carl showed me a photo of the dirt from 13F. I believe Harold suggest he take it home and plant some carrots or maybe wheat. Clearly it was a lot of dirt and it is easy to see why 13F was not displaying much accuracy. 45H had some dirt, but also has a filter inline which seems to have been doing its job. I will order some additional filters so that we can protect all of the gliders and instruments from the dust. That's all I know about the day since I spent most of it away from the field. Hope I didn't miss anyone. After a briefing on 5H and what to expect, Craig and I pushed 5H back to the line and got ready for launch. I wanted to launch around noon and as it was, we managed to go wheels up at 12:10 behind Alex. Alex cranked up in a nice thermal with us for a quick tow and release at 2500msl. Off they go on what proved to be a great flight south. Alex Caldwell landing after towing Morgan and Craig aloft. Off tow the climb was only 2-3 knots and I was expecting more based on the beautiful cu filling the sky. Punching over to the ridgeline didn't produce much better results despite winds favorable to the ridge and good clouds. It was consistent, just relatively weak at 2-3knots. Good enough to pursue the task though. From a little over 5000 and cloudbase near Tar Peak we headed out to the south towards the 41 Pass. There were clouds everywhere. Bases were about the same at around 5500 for the most part. The rasp had forecast higher bases to the west, but these were not showing yet. Bases on the Cholame Hills were probably only 4500. With relatively low bases, it makes things interesting. Often times it can be very hard to head out away from Avenal. You need to snap the rubber band before your mind is free of the distraction of getting back to the airport. Yesterday, I had snapped the bands before I even got to the airport. I had the right mindset for going XC and that is a huge advantage. I knew we might land out, I had mental contingencies in place and great friends watching my back so it was really about enjoying the challenge and accomplishing a goal. Approaching the La Panza Range. Pozo on the other side. Black mountain is under the right wing. We found consistent but weak lift heading south. No higher than 5500, but past Twisselman North we had a good energy line that let us run for over 20 miles without needing to circle. This took us in to the La Panza Range to the east of Black Mountain (the radar domes north of Pozo) and things started to get weak. Good clouds, no organized lift. Further east lay the Cuyama Valley and cloudbase that was right on the ridges of the Sierra Madre and Caliente ranges. To the SW there were higher bases, but no known landable fields back behind Huasna. Plenty of fields and roads, just no airstrips. To the West was Pozo and the Pozo East airstrip and some good fields. With that in mind I backtracked along the La Panza looking for a climb and to be better position to dive over into the Pozo valley. Finding nothing along the La Panza, I dove into Pozo and found a ratty climb in the lee of the mountains. A few hundred feet and confident the valley was going to be working I pushed west further and found a better climb. Same location, with a bit more of the Santa Maria valley showing. You can see the dust from the dunes showing the 20-30mph winds off the ocean. Approaching Twitchell Reservoir and the nice line of cu along the foothills. We leveraged that to jump to the South. At 5500 again we could reach Santa Maria which was about 22 miles almost straight downwind and we had nice markers to draw us south. This line also got us over lower terrain and gave us a better working band. Winds were coming off the ocean pretty strong and lost of dust was blowing off the Oceano dunes. There was a well marked convergence line along the Santa Maria river with beautiful clouds and tendrils hanging below them a few thousand feet. Hmm, I wonder where we should go. Looking South towards Santa Ynez and Santa Barbara. Twitchell reservoir (loose definition) on the left. Only a few acres of water this year. A climb near Twitchell reservoir got us over 6000 for the first time and gave us the legs to push towards Santa Ynez. By this time we were hearing Dennis Galloway calling in from at least 15000 in wave out over the ocean at Gaviota and Peter Hartman (RA) was trying to find the connection. We worked east up the Sisquoc until nearing Zaca road where the clouds took a sharp turn towards Gaviota. Who has two thumbs and thinks soaring is AWESOME? This guy! Craig on his first XC excursion. Just finishing our crosswind leg and about to turn downwind towards Buellton. 101/154 is right at the center of the frame. We chased this line with over the ground speeds in the 100kt range with the increasing tailwind. The clouds extended all the way to the Gaviota Pass where Dennis had connected with bow wave that gave him the altitude to go over the back and find the wave over the ocean about 2 miles out. After a couple of hours working clouds, I think I missed the subtle bit of wave that may have been present upwind of the final clouds. Instead I went all the way to the ridge line, meeting up with Terry and Denny in TH, in Terry's Stemme VT-10 as they climbed out from Santa Ynez. We worked the area in broken lift, but nothing substantial or laminar in nature. On reviewing my track, I see that I flew through a band of 2knot lift upwind about where Dennis said I'd find the wave. That may have been the ticket. Dennis flying topcover all day ensuring we made it home with a radio relay in orbit. Photo Dennis Galloway (65). Dennis was now at 17500 and exploring the wave, hoping we'd connect. He reported 70+mph winds from the NNW. We had 24kts at 4000ft. 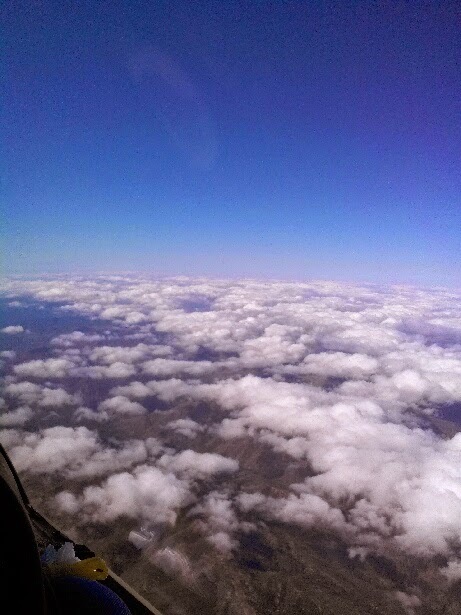 Working to the east towards some higher clouds we clawed back up to 5000. At that point I decided it was getting late, nearly 3:00 and we needed to start the run for home. We'd just use the thermals and clouds and hope for better energy lines than we had found on the run south. I pushed out to the north and over the airport at about 5000. I could climb flying straight ahead, but the thermals never wanted to cooperate when I would turn. Finally just south of the airport and over the top of Santa Barbara Soaring we connected with a climb to over 6000 that I felt was our ticket to start home. Running NW we found a friendly line heading back towards the Sisquoc and the first clouds near where the 101 turns to the South before 154. It took a deeper push towards the Sisquoc to get upwind of the convergence line and there we found good lift from 4k back to 5700. Our next good climb took us over 6k and let us run under the clouds at a reasonable pace, stopping for a couple of good thermals that averaged well over 5 knots. Convergence Shelf near Santa Maria. Above the clouds. Looking east towards Twitchell. Just North of the 101/166 intersection we hit some nice lift in the blue and I stopped for a few circles. At first I thought I had just found a nice thermal that hadn't formed a cloud. A few turns later the flow went laminar and smooth and we were in wave. We used this to climb to nearly 8000, but the climb was slowing. I probably drifted out the back of the best lift, but we still were making better time under the clouds than trying to get on top and into the stronger headwinds. We pushed on, San Luis Obispo was within easy glide. The ATIS at SBP was reporting 330 at 20kts and I switched to the 124.00 to monitor traffic as we approached their straight-in approach corridor. We were well above a normal approach, but I appreciate knowing who is around and what the traffic volume is like. The Flarm PCAS had been working great all day and there were a few other planes that it helped alert me to near Santa Ynez. Nobody in our area near SBP though. Nearing 8000, but losing the lift. Probably too far downwind, paying attention to the clouds, not the ground position. Surfing the leading edge of the clouds in wave. We crossed north of the extended approach centerline and headed towards a cloudstreet that looked promising near Santa Margarita Lake. Approaching the High Mountain area I spotted a bird. I believe it spotted us about the same time and as I zeroed in on it, it tucked its wings and headed for us for a fast approach and display. A mature Golden Eagle zoomed in for a closer look with an aggressive stance, then joined us for a turn or two before diving down to his mate a few hundred feet below us. I'm going to assume it was the male getting all territorial with us, but it was a real treat to share a few turns with an eagle. Should definitely give Craig a new experience to share with friends. Peering north through a gap. SBP is just barely visible at the center of the image. 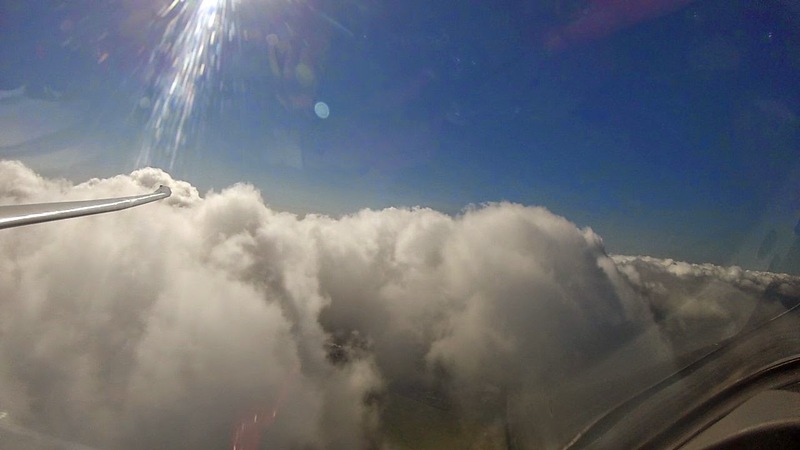 We dropped below cloudbase soon after and continue the run for home. We had some unfriendly territory to cross and a stiff headwind to deal with so I stayed high and climbed a bit more than I might have on a lighter wind day. We were able to take a fairly direct line to Shandon and picked up a climb south of there, then another nearly at town. A final climb on the Cholame Hills put us in good shape for final glide into Avenal. I initially thought we might have to go north towards Priest Valley to stay under clouds and get over the mountains, but there was a friendly line south of Black. Much friendlier than I anticipated actually. With final glide in the bag I finally handed the ship over to Craig. I usually try to let my copilots fly a good portion of the flight while I call tactics. This day was just a little too edgy and I was fairly focused on staying high and in the game given the winds and low clouds. We crossed the final ridge and of course found 9kts of lift at one point. He flew around for a bit, getting a handle on the control harmony. We then did some stall series, something he'd have done if he had taken his lesson today as planned. We then took it home fairly quickly and gave our crew a low pass salute before touchdown at 5:45. Alex, Carl and Jan were all present for our landing and helped disassemble before we grabbed a bite at the carniceria and headed our separate ways. Everyone seemed to have a good day and it's great having people watch your back. It really makes these kinds of flights possible when you know that your network of friends will be there to collect you. We had Dennis in Santa Ynez flying top cover at 17500. He monitored our progress until we were setting up for a landing. Ready to broadcast our position from orbit near IZA. Martin was monitoring us from Paso Robles, ready for a retrieve and then the guys staying behind at the airport until we returned.